Welcome to the Victorian Refugee Health Network. We work to develop responsive health service systems that meet the needs of people from refugee backgrounds, including asylum seekers. Photo: Tracey Cabrié addresses a small group discussion at the statewide meeting. Photo credit: Annette Ruzicka Photography. Victoria has a vibrant community of primary, tertiary and allied health care workers who actively pursue better health outcomes for people from refugee backgrounds, including people seeking asylum. Engage with some of the following. More opportunities are listed on the right of this text. 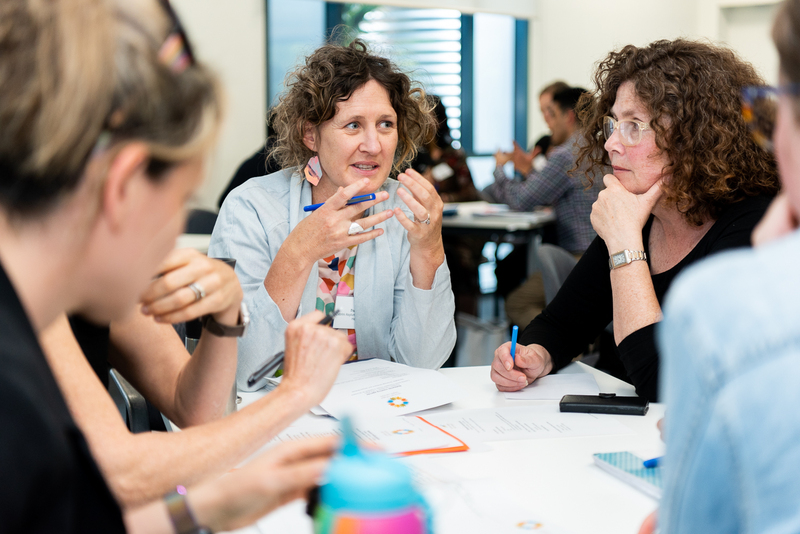 Statewide meetings held three times a year are open to people providing health care to people from refugee backgrounds, including those seeking asylum as well as professionals involved in connecting people to health services. Subscribe to our statewide meeting email list. Working groups are forums for issues to be explored in detail and strategic approaches to be developed to influence change in service delivery and policies. Local refugee health networks provide a forum for local area coordination. They set priorities according to the needs and views of their regional membership working on a range of projects to improve referral pathways, health care delivery, and engagement with local communities from refugee backgrounds, including those seeking asylum. Victorian researchers have produced volumes of high quality research into refugee health in Australia. A comprehensive catalogue of refugee and immigrant health research can be found at the Royal Children’s Hospital Immigrant and Refugee Health website. If you would like to know more about researches or connect to research and study centres, please see our Refugee Health Researchers page.